Elevated between 5381 ft and 11286 ft, the Ski Resort is the highest elevated Ski Resorts in Austria. The vertical drop from summit to base is 5906 ft. The average difference in altitude between base and summit of Ski Resorts in Austria is 2392 ft. Most runs are therefore relatively long. Season starts on Sep 15 and ends on May 5 (232 days). Average season duration in Austria is 114 days. Average snow depth during the season (Sep 15 to May 5) is 85 " at summit elevation and 60 " at base elevation. Snow coverage is usually best during March, offering an average snow depth of 127 " at summit elevation and 103 " at the base. 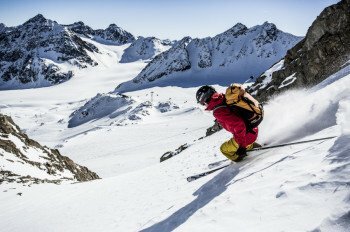 Therefore Pitztaler Gletscher Rifflsee is among the 10 ski Resorts with best snow conditions in Austria. Pitztaler Gletscher Rifflsee features 113 sunny days on average per season. The average for all ski Resorts in Austria is 103 sunny days. Oktober is the sunniest month with an average of 22 sunny days. The two ski resorts Pitztal glacier and Rifflsee welcome all skiers and riders at the end of Pitztal. Both areas combined feature 120 ha and 41 kilometers (25,4 miles) of skier accessible terrain from September to May. From Mandarfen you can access all trails around Rifflesee. This area is considered to be ideal for families. Beginners find the practice slope Mandarfen right in the valley. As soon as you feel more comfortable on your skis you can change to the other side of the mountain. From here, grab Rifflseebahn gondola to the ski resort. Up here you can enjoy the trails off Hirschtal lift. At the same time it´s a great place for expert skiers because three blacks are accessible. Grubenkopf with its additional red and black marked runs is a hots pot if you count yourself among experienced skiers. The blue run No. 1 takes you right back into the valley or you can make a turn to Mittelberg along the way. The underground railway ´Gletscherexpress´ leaves from here in order to bring you to Pitztal´s second ski resort. The area around the mountain station is a kids park where kids go tubing and sliding. This part of the ski resort is mostly designated for intermediate and expert skiers with only two blue runs at Mittagskogel and Brunnenkogel. The remaining trails provide endless choices for experienced athletes. Get a ride to the summit of Hinteren Brunnenkogel with Austria´s highest aerial cableway, the modern Wildspitzbahn. It tops out at 3440 m (11.286 ft). Allow yourself a few minutes to enjoy the breathtaking panorama before you hit the wide glacier slopes. Head to the left at Wildspitzbahn where a halfpipe and a permanent race slope guarantee action for everyone. Take the Mittelbergbahn to additional red slopes, a terrain park and a boardercross. The park is suitable for all levels and abilities. It´s a freestyler´s paradise with different rails, boxes and kickers. Moreover, Pitztal is well-known among freeriders. Thanks to the ideal situation of being that close to the glacier you can start the season early every year. 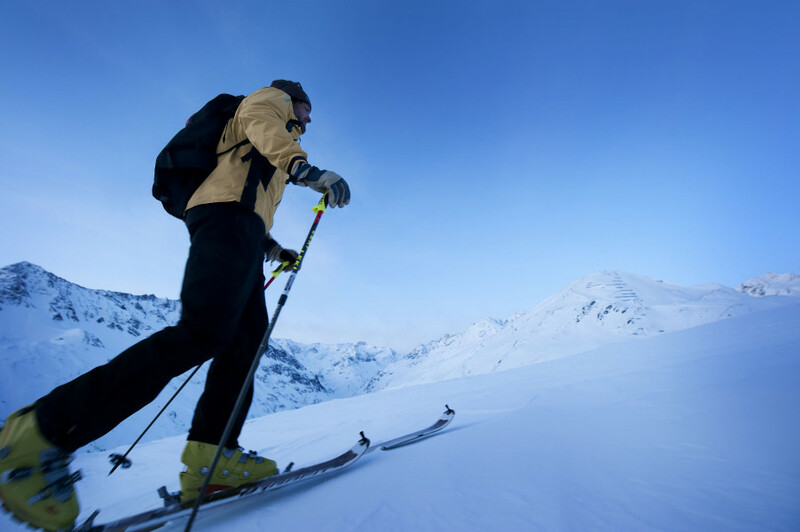 Try the popular off-pistes at Mittagskogel, overcome 1500 height meters (4921 ft) along the way into the valley. The Swiss slope at Mittelbergbahn and tree runs at Mutterkopf in the Rifflesee area provide great conditions for freestylers. The cafe 3440 at Pitztal´s glacier expects guests with fantastic coffee and cake but the highlight is definitely the free-floating terrace to enjoy the breathtaking view in all of it´s glory. The mountain station of Gletscherexpress awaits hungry skiers with two restaurants to choose from. The Kristall restaurant at first floor has a self-service cafeteria filled with Tyrolean specialties and Pasta of all kind. The second floor offers international dishes but you will notice Tyrolean influence as well. Those who prefer sweets or still have room for dessert shouldn´t miss out on the cake in Tyrol´s highest patisserie. Sunna Alm, a mountain restaurant in the area of Rifflsee, spoils guests with savory and sweet treats, plus you can help yourself at the fresh soup buffet. The Rifflsee mountain hat comes with a comfy atmosphere and leaves you tempted to stop for a break. The rustical Tschach Alm/Pitztaler Schihütte at the valley slope pampers winter fans with traditional cuisine. At Pitztal glacier experienced skiers really shouldn´t miss the challenging run at Grubenkopf (No.9). The 2,3 kilometer (1,4 miles) long run that stars at the mountain station of Mittelbergbahn is a real highlight at the glacier (No.36). A highlight away from ski fun: Not just one, but four toboggan runs welcome winter vacationers in St. Leonard. The Hairlach run brings 2,5 kilometer (1,5 miles) of pure action and in Piösmes you can ride 2 kilometer (1,2 miles) down the mountain. Two tobogganing runs light up a few nights each week: the run that starts at Pitztaler Skihütte and takes you to Mandarfen plus the one serviced by the practice lift in the valley. This way the thrill doesn´t have to stop when the winter sun sets. The winter hiking trails in St. Leonard are also appealing for a relaxing walk after skiing. This way you get to really enjoy Pitztal´s nature along the cross-country ski trail Rifflsee or you hike all the way from Mandarfen to the Pitztaler Schihütte. The local ski school offers snowshoe hiking as well. Pitztal is well-known as an ice climbing region. Thanks to the glacier there are many ice falls in St. Leonhard that can be climbed. Both beginners and professionals are going to find personal challenges. 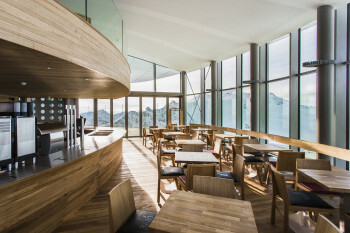 A day in the ski resort wouldn´t be complete without a drink at the Kristallbar, located at Pitztal glacier. The big sun terrace is the perfect place to celebrate a successful ski day. Back in the valley of Mandarfen you have even more places to end the day with Apres-ski: For example Schwalbennest, Dorfstadl and Hasi-Schirmbar. An other meeting point for party people is Hexenkessel, only 500 meters (1640 ft) away from lift facilities. Siglu is the right address for live music fans on Saturdays. The restaurant Bergwerk (mine) convinces with an outstanding atmosphere. The restaurant´s interior definitely reflects what its name promises. Forellenstüberl on the other hand is famous for fish specialties and the restaurant ´s´Pfandl´ has home-style dishes and an exquisite wine list. You can reach Pitztal via Inntal freeway (A12). Leave at exit Imst-Pitztal and follow the Landesstraße to the lift facilities. Imst is the closest train station and 30 kilometers away. Trains coming from Innsbruck and Landeck have a stop here. Busses travel between Imst and Pitztal. Those coming by plane should book a ticket to Innsbruck.